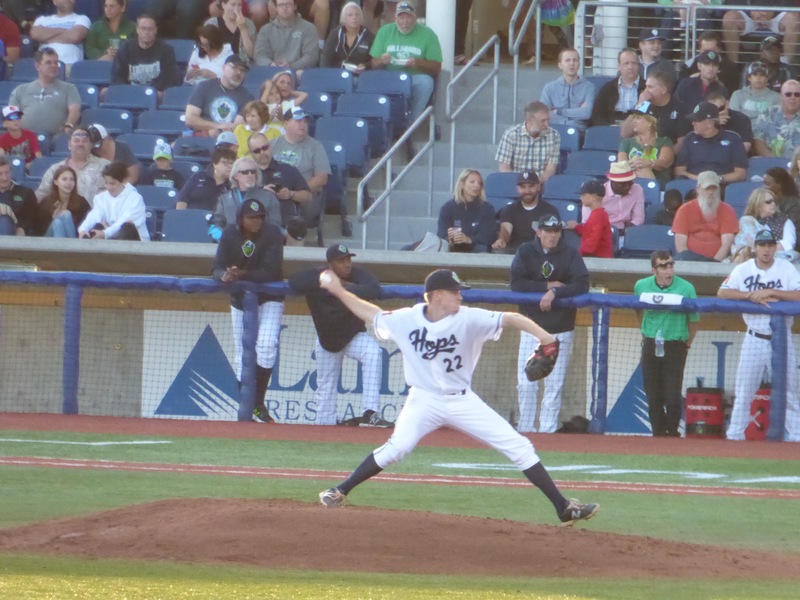 June 20, the summer solstice and the Hillsboro Hops home opener against the Eugene Emeralds at Ron Tonkin Field. A beautiful evening for a baseball game, but, unfortunately, I waited too long to get a ticket and was relegated to the grassy knoll in distant left field. That position, being so far from home plate and having the sun shining directly in my eyes, was far from ideal for viewing the game. Perhaps fortunately, it wasn’t much of a game. The Ems won 6-0, partly as a result of 4 errors by the Hops. One (maybe the only one) benefit of sitting on the ground just past left fielder Matt McPhearson was that I got a close up view of him chasing Monasterio’s home run shot that just cleared the left field fence. He was positioned maybe 25 yards in from the fence and started back immediately after the ball was hit. Because I couldn’t see the ball off the bat, I watched him run back in an attempt to catch it. It seemed to me he didn’t run full speed, and he didn’t catch it, but I thought he could have.